Congress has to authorize the Pentagon's plan for Space Force. So, you want to join the Space Force? According to new details in the Pentagon's legislative proposal for the nation's newest military service, there are no plans for a separate Space Force Academy. But the Pentagon will work to move personnel into the service over the next several years. The legislative proposal outlines cost estimates, organizational details, and personnel plans for the Space Force, which will be housed under the Air Force. But it will now be up to Congress to authorize those plans in the 2020 National Defense Authorization Act and bring Space Fore to life. "This is an historic moment for our nation," said Acting Defense Secretary Patrick Shanahan in a statement on Friday. The Department of Defense's legislative proposal to establish the United States Space Force as the sixth branch of the Armed Forces is a strategic step towards securing America's vital national interests in space. Our approach follows President Trump's bold vision for space and commits resources to deliver more capability faster, ensuring the United States can compete, deter, and, if needed, win in a complex domain." Here's how the Pentagon hopes to stand up Space Force. Senior defense officials said on Friday that while the legislative proposal does not recommend the establishment of a Space Force Academy, there will be a strong emphasis on recruitment. This will likely take the shape of a personnel and training center, officials said. When Space Force is complete, the Pentagon believes it will have about 15,000 personnel, including enlisted, officers, and civilians. Most of these people will be transferred into the Space Force from the Departments of the Army, Navy, and Air Force. (Airman 1st Class Dalton Williams/U.S. 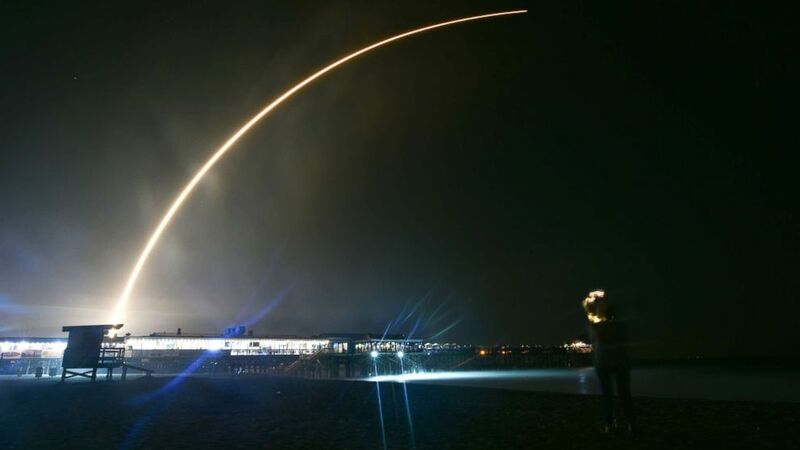 Air Force ) People watch SpaceX's Falcon 9 rocket PSN VI launch from Cape Canaveral Air Force Station, Fla., Feb. 21, 2019 at Cocoa Beach, Fla. Still, at 15,000, the Space Force will be the Pentagon's smallest service. "It's a small but mighty group," one official told reporters. The Pentagon's plan estimates it will cost $72 million in fiscal year 2020 to establish Space Force headquarters at the Pentagon with about 200 personnel. Then, beginning in 2021, space-related units from the Air Force will transition under the Space Force, followed by space personnel from the Army, Navy, and Marine Corps in 2022. "It will take some time," one official acknowledged. The Pentagon estimates that total additional cost growth over those first five years will be about $2 billion. Once Space Force is fully up and running, additive costs will be about $500 million per year, officials said, which is about 0.07 percent of the Defense Department's annual budget. The new service will have an Under Secretary for Space who reports to the Secretary of the Air Force, as well as a four-star Chief of Staff of the Space Force who will sit on the Joint Chiefs of Staff. 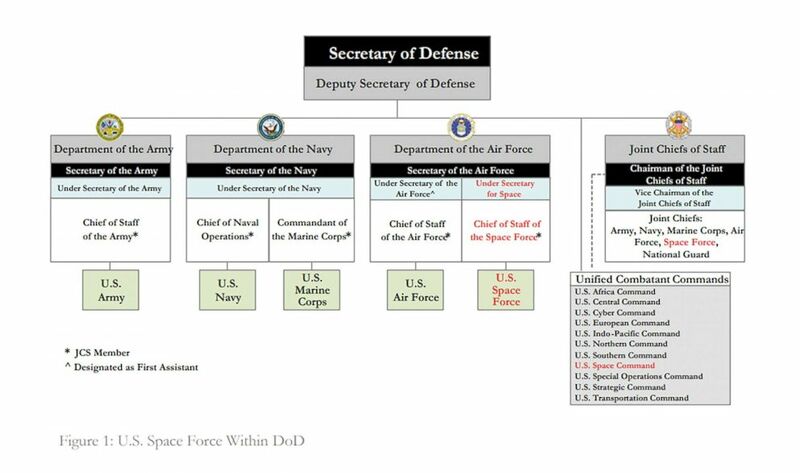 (Department of Defense) The Space Force will be located under the Department of the Air Force with an Under Secretary for Space and a four-star Chief of Staff of the Space Force. It was only one year ago when President Donald Trump first mentioned the concept of a new space-focused military branch. “Space is a war-fighting domain just like the land, the air and sea. We may even have a Space Force,” Trump said during a speech to troops at Marine Corps Air Station Miramar in California last March. "We have the Air Force, we’ll have the Space Force," the president said, adding, “I was not really serious, but then I said what a great idea." The current structure for Space Force is not the "separate but equal" branch that Trump had originally directed, but officials said that the current legislative proposal allows the Space Force to be elevated to its own department if at some point that decision is made in the future. In the meantime, the fate of the Space Force lies with Congress.